Blackcraig Hill is a popular walk as it is one of the highest hills in Ayrshire at 2,296 feet above sea level, if not the highest. The area is about 800 feet above sea level so the actual hike should be about 1,400 ft. There are another three hills next to Blackcraig, one over 2,000 ft and the others just below 2,000 ft. Many people want to go round the four hills. Finding Blackcraig Hill is the first thing to do. Travel to the town of New Cumnock in East Ayrshire. On the south side of the town following the A76, you will see a small roundabout with a turn left to Dumfries, and a turn right to Dalmellington. Take the road to Dalmellington and after only 50 yards, you will see the sign below pointing to Afton Road, Camping and Burns Cairn. Blackcraig Hill is about 4 miles down Afton Road. Road Map . Hill Walking Map . After about 4 miles down Afton Road, you will see a narrow farm road lead off to the left with a small bridge crossing Afton Burn (Afton Water). The hill in the distance below is Blackcraig. Just before the burn is parking for about two cars only. From the car park, as seen below, you can see the Blackcraig Farm road leading up to the north side of Blackcraig Hill. You then cross a field and work your way up onto the main hill. This is probably the steadiest way up, but if the car park is full, or you want a stiffer challenge, drive on about another mile to a larger carpark by the west side. There are no trails to follow, so it is over moorland with some soggy patches here and there, so hiking boots are essential. These are sheep farms, so best not take a dog, or, keep them on a lead. About 1 mile further down Afton Road, you pass a small farm, then about 200 yards further on are two cottages with parking in front of them, as seen below next to two storage units. This view below shows Blackcraig Hill steep west side. The map below shows the different routes to hike Blackcraig Hill, and the three hills on the same range, Blacklorg Hill at 2,234 ft, Cannock Hill at 1,948 ft, and Craigbraneoch Rig at 1,889 ft. 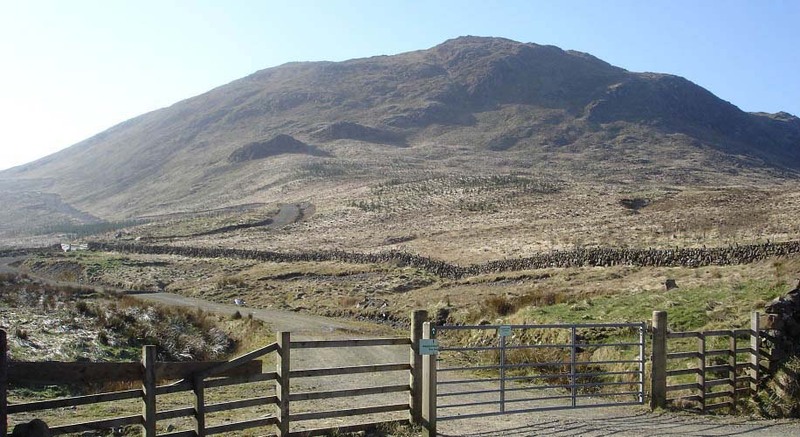 There are two steep routes onto this range, one up the west side of Blackcraig Hill following a gully, and one up the north side of Craigbraneoch Rig. The photo tour below is going up the steep north side of Craigbraneoch Rig, round the four hills, then down the steep west side of Blackcraig Hill. Below are a few images with information of the four hills going anti-clockwise from Craigbraneoch Hill round to Blackcriag Hill. At Craig Farm, you take the road south round towards Craigbraneoch Rig, the one with the peak, as seen below. The direct rout is up the north side, a steep testing hike that is good and dry. The view below is from just over half way up the north side. Once you have walked about 1 third of a mile along the forest path, as seen bottom right, and are level with the start of the north side, you can follow a fence from the path that leads to a gate. The gate leads to this route up. Best only go up or down this route in good visabilty, as there are a few cliffs either side. The summit of Craigbraneoch gives views over Afton Dam and the 1,948 feet Cannock Hill to the south, the next peak. From close to the top of Cannock Hill, looking back north, you get good views of Afton Dam/Reservoir as seen below. This view also shows Craigbraneoch south and west sides are an easy hike compared to its steep north or east sides. The route across is a bit soggy at the lowest point, but nothing too bad. There are walking signs from the top of the dam that point to a path through the trees, out onto the side of Craigbraneoch. You have to climb a hundred or two steps to get up to the top of the dam, then it is only about half of an hour from the top of the dam to Craigbraneoch summit, good dry hiking. The safest and quickest way up or down. The summit of Cannock Hill, as seen below looking east, shows the next peak, Blacklorg Hill at 2,234 feet, 286 feet higher than this peak.. The view below is when crossing over at the end of the glen showing Craigbraneoch Hill left and Blackcraig Hill right. Large Image looking up the glen. The view below is after crossing from Cannock Hill to Blacklorg Hill. The walk down and across was easy going and dry, just this hike up was a bit testing. 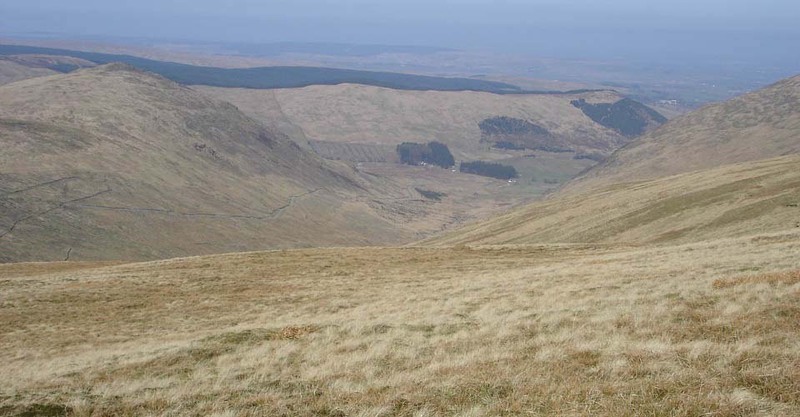 The view below is from the side of Blacklorg Hill looking up Afton Glen. Large Image. The view below is from Blacklorg Hill summit looking north to Blackcraig Hill at 2,296 feet, 62 feet higher than this one. The view below shows the south side of Blackcraig Hill after descending from Blacklorg Hill. Its about 500 ft down then back up. This low area is a bit soggy in places, nothing too bad though. Large Image. The view below shows Blackcraig Hill south side when aproaching the summit. 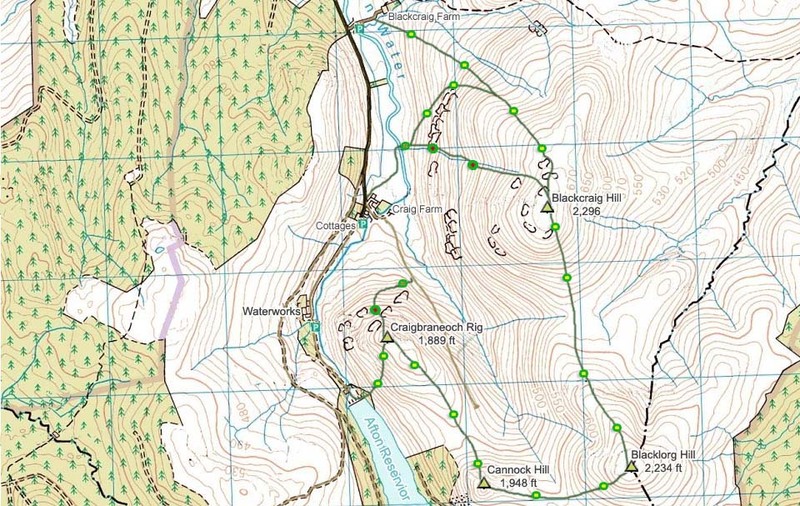 The two hikers here are going round the four hills clockwise, starting from Blackcraig Farm at the north side. Large Image. The view below shows Blackcraig Hill summit from the south side. The view below shows Blackcraig Hill summit looking north towrds New Cumnock. There are three ways down from here, head north towards the Wind Farm and down towards Blackcraig Farm, head north then follow a stone dyke down the north shoulder, or go down the steep west side following a narrow gully. Following the gully down or up the steep west side is best only done when visibility is good, as there are high drops not far off eaither side of the gully. This route gives the best views though, and is the fastest. One hiker claimed to have hiked up this route in about 1 hour. The view below shows the gully where you have to cross over for the best way down. The view below is from the bottom of the gully showing there is a little rock climbing to be done, but nothing difficult. Crossing Afton Burn to get back to the car park is normally easy, but watch out for wet stepping stones. If it has been wet, and you do not fancy crossing the burn, you can follow the burn up to Blackcraig Farm where there is a bridge. The view below shows the gully going up the west side of Blackcraig Hill. There is a stone dyke that leads up onto the north shoulder of the hill towards the wind farm, that is not as steep and safer. Once you cross the burn it is through a field up to the road here and car park at the two cottages. These are good hills to hike with not too many wet spots, and a fairly good road right to the bottom of them. From the road leading to the dam, just past the dam car park, there is a marked trail that leads up onto the hill named Windy Standard at 2,290 ft. This hill has a wind farm on it. Short Video of the four hills, the part up between Cannock and Blacklorg is a great view.